Pete Lucock of Yorkshire Carnegie is caught in a double tackle. 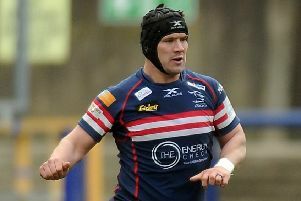 Yorkshire Carnegie boss Chris Stirling praised the commitment of his side yesterday after a last-minute try gave them a bonus point victory over a belligerent Richmond. Striding into a now-imposing Emerald Stadium where they suffered only two defeats during the 2017/18 season, Yorkshire’s task was to reignite the optimism surrounding the New Zealander after an opening-day defeat at Hartpury that the man himself had rendered “extremely disappointing”. “One thing about this bunch of young men that you can’t question is the level of their commitment and desire. His players wasted no time in getting their home form started and after sustained early pressure in the corner, No 8 Dan Temm crashed through a lightweight Richmond midfield to gift Brendan Cope a simple conversion after just six minutes. Apprehension settled, Carnegie set about attempting to control the fixture in worsening handling conditions. A handsome veil of rain proved relentless throughout the first half and part-time Richmond initially gave as good as they got as the match became an energy-sapping battle up front. Without their injured captain Richard Hayhew, Richard Beck was moved into the back row to give dual-registered Bath youngster Will Britton his debut at lock. The 22-year-old has spoken of his appreciation for the physical side of the game in the build-up to the match and produced a performance to illustrate the fact. Indeed, the entire pack produced a response to criticism of Yorkshire’s efforts at the breakdown last time out. Stirling said: “We chose today to be more contestable than go for territory and I think that it paid dividends at times. But the first half was far from a classic. Possession was traded with regularity, handling errors from both sides dominating a poor first half, and the crowd of 1,500 were gifted the sweet release of half-time with the score jack-knifed at 7-0. Richmond’s efforts were not aided by kicker Rob Kirby, whose form whilst accruing 13 points in their win over London Scottish last week was not carried over. Moments after the break his missed penalty was punished by Yorkshire, who crossed over through full-back Chris Elder after a classy cross-field kick by Brendan Cope. It was the sort of incisive move that Stirling is hoping to see more of as the side grows into his three-year plan to climb back into the top division. “We’re two games into what I’ve called a 24-month or 36-month season. All we’re trying to do is build a foundation for where we need to be in about 24 months time when hopefully we’ll be top of the heap. After a toiling first half, the match came alive on 50 minutes as Richmond struck back with a converted Luc Jones try. As it happened, any pressure from the London outfit was far too fleeting as the superior fitness of full-time Carnegie showed. Dan Moor’s second try in as many matches essentially put the result beyond doubt and from there the match became about whether Yorkshire would get their bonus point. That they did, secured by Academy-graduate debutant Sam Wostenholme as he darted over in the corner in the last play of the game. “There was some good, there was some not so good and there was some okay,” said Stirling. “This place can become a fortress, but that won’t happen by talking about it, we need to put that together with hard work. “We’ve got to build that,” he added.